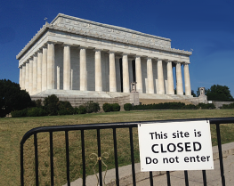 Government agencies, national parks and monuments, including the Lincoln Memorial in Washington, DC, have been closed for three days due to a government shutdown, brought on by Republican lawmakers’ refusal to pass a budget unless Democrats agreed to defund Obamacare. The government shutdown poses severe risks for federal workers and their local communities, says NFFE-IAM Federal District 1 President William R. Dougan in a new Machinists News Network video. As Congress fails to pass a budget and enters day three of closed government, Dougan says 70 percent of his 110,000 membership are being held hostage. In all, at least 800,000 federal workers, including NFFE-IAM members, are either furloughed or working without pay. Dougan says many NFFE-IAM members work outside of Washington, DC. They live in small towns around the country, performing a variety of jobs ranging from fighting fires to providing health care to veterans. The shutdown will have a severe impact on those local economies. The shutdown began Tuesday, October 1, 2013, when Republican members of Congress refused to pass a budget unless Democrats agreed to defund the Affordable Care Act, also known as Obamacare. However, there are reports today that, in a push to end the shutdown swiftly, a growing number of House Republicans say they will now support a bill to fund the government without the health care requirement. Take action now by clicking here. Tell your Senators and Representative to pass a clean budget and re-open the U.S. government for business.